If you already submitted paper in any journal of A D Publication you must submit your paper using login ID. Once your paper has been submitted successfully, you will receive an email from system. This email contains user name and password. With help of user name and password you can track your paper. Once your paper has been published successfully, you will receive an email from system than you are able to generate certificate. A D Publication Journal invite Original Research Article. A D Publication Journal welcomes national and international conferences to publish their proceedings online and print versions. Report written By: Professor & Head,Kahalekar Dhananjay N ,Department of kayachikitsa, Government Ayurved College, Vazirabad, Nanded,India. If any A D Publication Journals paper is matching with your own previously published paper, you have to submit claim form. The focal theme of this International Conference is “Recent Trends in Electronics and Communication (IC-RTEC)”. The aim of the conference is to bring together researches, scientists, industrialist and students to share and discuss knowledge of community based planning and practices from different parts of the state, country and world, particularly India. Integrate the lessons learnt into national and international development programmes to enhance ultimately the capacity to improve the livelihoods for entire community. 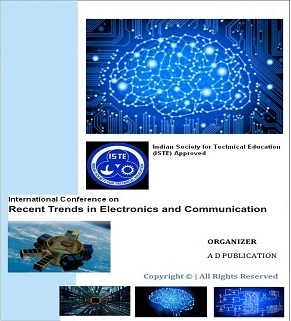 A D Publication Organize 2nd International Conference on Recent Trends in Electronics and Communication On ( Date: Comming Soon) at ( Place: Comming Soon ). If you are not able to come at venue, mail 10 slides of paper. Embedded systems are special-purpose computers built into other things. Research papers that propose is presenting the novel methodology. Review articles are providing reviews and critical evaluation of developments in a specific topic of interest. Short communications describing initial research findings of potential significance, and substantive comments on previously published papers. Technical notes that focus on the implementation of established methodology. Main Objective of the conference is to bring together researches, scientists; industrialist and students to share and discuss knowledge of community based planning and practices from different parts of the state, country and world, particularly India. Integrate the lessons learnt into national and international development programmes to enhance ultimately the capacity to improve the livelihoods for entire community. Department of Electrical Engineering, University of Technology, Baghdad, Iraq. Faculty of Exact, Physical and Natural Sciences National University of Córdoba, Córdoba, Argentina. Full length papers, which are not under consideration for publication elsewhere are invited from the participants on the Sections of Focal Theme. The participants may submit the full length paper in format available on International Conference page.On successful submission of paper, our peer review committee will scrutinize and review the paper submitted. After confirmation from our reviewer team, you will receive acceptance mail from our team. However, the decision on the oral mode of presentation by Chief Coordinator will be final. The full length paper must be submitted online to the portal before dead line, after which no papers will be accepted. All papers will be published in Conference Proceedings bearing ISSN/ISBN Number and selected papers will be published in relevant A D Publication Journal. A D Publication Journals brings together researchers, students and academicians from all over the world who works professionally to lift the status high by their ideas and research. The A D Publication Journals are a registered organization for the professionals in the field of Engineering and Technology. A D Publication Journals organizes conferences, workshops, technical support to conferences and workshops. Currently A D Publication Journals are also publishing peer reviewed papers of International and National level conferences conducted by various research and academic institutions. Special editions are also planned subjected to the scope and need. A D Publication Journals welcomes national and international conferences to publish their proceedings with A D Publication Journals online and print versions. It is the platform for Institute, University, College etc to share the knowledge. All accepted paper must be original. If conference proceeding is awarded by ISBN then review process will not be repeated otherwise all accepted papers may be reviewed again by our special team for final acceptance. Conference proceeding should not be shared with any type of other publication. Camera Ready Paper (Final Paper) should be prepared as per Conference Paper Template. Conference Proceeding may be published in special issue which can be published in any month as per guidance of Conference Convener. Conference will include A D Publication Journals information in all the brochures, banners, and other promotional materials, also at the time of Conference. Convener must use Journal information, link and logo in their conference after approval of respective conference. Authors are required to use a Manuscript/paper Format for preparation of Manuscript/paper. For your submission, please prepare your manuscript as a single file (a text file with embedded figures, tables etc. ), using the Manuscript/paper Format. Upload your .DOC or .DOCX file named as "Your paper title-your name" for better consideration. All Papers are considered to be the property of A D Publication International Journal from the time of submission. Only original papers will be accepted and published. It is the responsibility of the author to obtain permission to reproduce copyrighted material in his article. All submissions are subject to anonymous review. Articles submitted to this journal will be considered on the understanding that, the entire copyright shall pass to the A D Publication International Journal. Articles are considered on the understanding that, if they are accepted for publication, the entire copyright shall pass to the A D Publication International Journal. Editor-In-Chief has complete responsibility and authority to reject/accept an article. Editor-In-Chief has the rights to publish the manuscript submitted/received to this journal without any prior notification to the authors. We invite your suggestions or queries, please feel free to contact us.